Can you ever really go home again and settle the issues from your past? 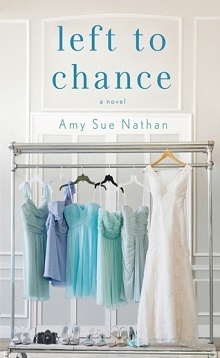 Amy Sue Nathan brings us the story of one woman’s attempt as she navigates the ties between family, friends, love and grief. Two things will always be true: the people who’ve known you the longest are often most set in their expectations of how you should be, and grief will drive you in unexpected ways as it demands you succumb and deal with it. Such are lessons that Teddi is about to face head on. Six years ago her best friend since childhood, Celia, died, and Teddi, now bereft, sad, and without the other half to her every thought slipped away while the funeral was being celebrated. Now six years have passed: her career as a photographer has taken her to unexpected places, a ‘loosely’ open relationship, no home to call her own but a series of hotel suites permanently hers, as photographer to a national boutique hotel change. Renowned for her wedding photos, particularly a celebrity’s wedding that made headlines, she’s back in town at the behest of her friend’s daughter, 12 year old Shay, to photograph a wedding. Not just any wedding, Celia’s husband Miles is remarrying – and the whole small Ohio town of Chance is waiting for the celebration. Where do you turn when every moment reminds you of the person, closer than a sister, that is no longer there? Teddi spent all of her childhood with Celia: they shared dreams and secets, laughter and even Celia’s younger brother. While everyone knows Teddi – they also all believe that she abandoned Miles, Beck and Shay when she ran away – and she’s never been strong enough to explain her reasons, or even actually deal with them. With friends reappearing and even insisting that she attempt to rejoin the life she had left behind, the contrasts between old and new, the changes in town and in her, and the slow-to-come realization that she’d been in a holding pattern since Celia’s death: afraid to commit, afraid to admit her own guilt and inability to explain that she never forgot – in fact a small bag of stones become a weight that drags her down, working as both a tether to her own feelings of rootlessness and a way to communicate moments to Celia – she slowly starts to engage as moments bring her answers, more questions and finally a sense of peace. Nathan does portray the grief as Teddi’s determination to clutch it closely is often the first impression she gives. Her own reluctance to actually engage, using her camera as a wall from people and her emotions. Occasional repeated ‘lump in throat’ moments may feel like overkill at first, and the pockets and rock connection takes a bit to understand, but I did believe that the process as Teddi came to understand her grief and release some of the guilt as she honestly thought about Celia’s wishes for the people she cared for, brought a sense of reality to the story. Friend or family – everyone who is lost to us requires we find a way to deal with the pain, sorrow and loss eventually it just took Teddi a bit of time to get there. Sweet and complex, the story does unfold to encompass loss, love, friendship and expectations – and does show just how different ‘going home again’ can be with a change in outlook and expectation. Twelve-year-old Shayna— talented, persistent, and adorable—persuaded "Aunt Tee" to return to Chance, Ohio, to photograph her father’s wedding. Even though it's been six years since Shay's mother, Celia, died, Teddi can hardly bear the thought of her best friend's husband marrying someone else. But Teddi’s bond with Shay is stronger than the hurt. Teddi knows it’s time to face the consequences of her hasty retreat from family, friends, and, her old flame, but when she looks through her viewfinder, nothing in her small town looks the same. That’s when she truly sees the hurt she's caused and—maybe—how to fix it. After the man she once loved accuses Teddi of forgetting Celia, Teddi finally admits why she ran away, and the guilt she’s carried with her. As Teddi relinquishes the distance that kept her safe, she’ll discover surprising truths about the people she left behind, and herself. And she'll finally see what she overlooked all along. GETTING PICKED UP ONCE meant flirting and free drinks. Today it meant hurrying through the airport in comfortable shoes. I wove in and out of the slow-walkers and rushed past restaurant outposts selling breakfast, lunch, and dinner. The sweet, buttery aroma wafting over from the gourmet popcorn shop didn’t slow me down, but when I reached a flower stand called Eliza’s, I paused. I could resist the bongo-like buckets overflowing with roses, carnations, sunflowers, and the assorted I-missed-you bouquets. What caught my eye was the faux-vintage signage and the way the flowers were shielded from the imaginary sun by an awning, all meant to mimic Victorian London. It didn’t hurt that the stand also sold energy drinks and earbuds. Nostalgia and irony. I resisted pulling out my camera. My phone dinged as the carousel spit out my suitcase. I wouldn’t make Shay wait more than a few moments for my reply. I’d known Shay—Shayna—since the day she was born. I remembered when she’d babbled and burped, when she’d first walked and talked. Now she was a thumb-typing, artistic tween who held a piece of my heart tighter than ever before, mostly from afar. But today, and for the next week, Shay and I would be face-to-face. First, we’d reminisce about meeting in Chicago last summer—tea at The Drake, climbing the wall at Maggie Daley Park, the miniatures at The Art Institute, and finding our way to the bottom of a tin of Garrett popcorn. We’d replay every detail but save the best fun for last, recalling how the hotel’s pastry chef let Shay decorate her own cake, which we later ate for dinner. Then we’d tick off the rest of the list: school, Shay’s art, friends, reality TV, and maybe, could it be possible—boys? I couldn’t wait to see her, hug her, spend time with her. I also couldn’t wait to leave. Shay: Dad will be a few minutes late. Me: Aren’t you with him? Shay: In art class sorry. Not okay. I didn’t want to spend an hour and a half alone in the car with Miles. Shay was the bridge, the bond, the buffer. And Shay wasn’t coming. I paced between the signs for taxis and shuttle buses. Car after car slowed as it passed, then kept moving, or stopped for someone else. I watched bear-hug reunions and aloof hellos. I smiled at every woman driver who passed. I even stifled a few waves. My insides rolled. This had to stop. Celia would not be picking me up. A horn beep-beeped and a white sedan pulled alongside the curb. I slung my camera bag over my shoulder and tipped my suitcase toward the trunk, my eyes on my old friend as he stepped out of the car. Miles’s hair was gray and a little thin, more than it had been when I’d seen him a year before—or since, in the pictures he’d posted on Facebook. He’d lost weight. I met Miles at the trunk. We reached our arms around each other and hugged hard, but quick. Miles wasn’t just thinner, he felt more fit than I remembered. What had been soft was now solid. But his newfound physique couldn’t hide the lines around his eyes. He looked tired. “Thanks for coming all the way out here,” I said. No one in my life now called me Ted. It sounded unfinished, yet smooth and familiar. Miles smiled and just like that, memories broke through. Was he remembering, as I was, our long-ago friendly teasing during Scrabble matches and Pictionary marathons with Celia? We’d always joked that with Celia as his wife, and my best friend, we were practically related. Amy Sue Nathan is the author of The Good Neighbor and the founder of WomensFictionWriters.com, which was named a Best Website for Writers by Writer's Digest. Amy lives in Philadelphia and has a grown son and daughter. You can find her online, often when she shouldn't be.